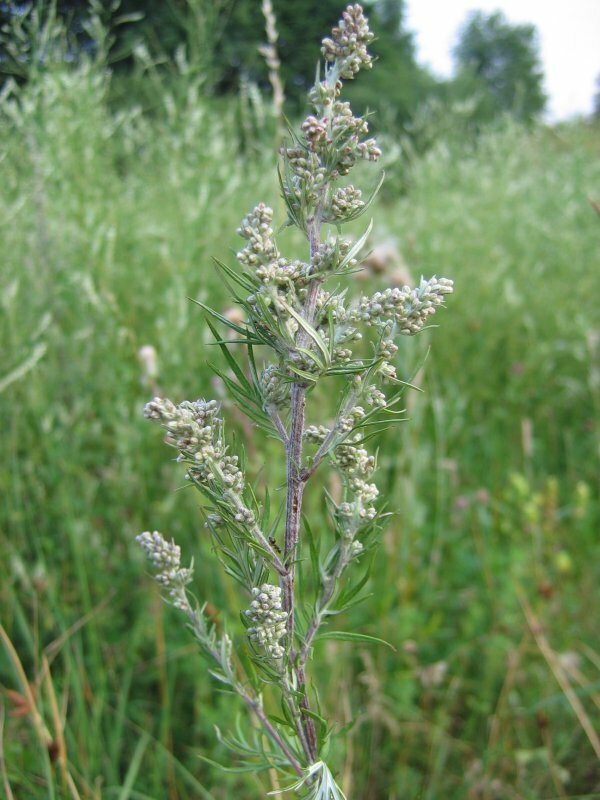 Artemisia vulgaris is a perennial herb, 0.5-2 (3) m tall, aromatic, aggressively spreading by rhizomes, forming a dense root-mat 7-18 cm deep; lower stem turning brown and woody as inflorescence develops (Barney and DiTommaso 2003). Roots are colonized by arbuscular mycorrhizal fungi which contribute to both phosphorus and nitrogen nutrition in N, P deficient soils. It has been shown that colonization is inhibited by high N, P soil concentrations (Blanke et al. 2005). Leaves alternate, 5-10 cm long, 3-7 cm wide, divided (like chrysanthemum leaves) segments again divided and toothed, gray-green above, white, wooly below, leaves of inflorescence much smaller, narrow; winter plant retains leaves, white below, dark black-brown above. Flowers green to reddish, tiny, tubular, radially symmetrical, 0.2-0.3 cm, in compact heads about 0.4 cm tall, that arise from a bract-covered floral base (receptacle); wind pollinated; inflorescence covering the upper 1/3 of the stem, densely branched, large, leafy, at top of plant; blooming July-Sept.
Artemisia vulgaris.flower heads in bloom. Thuilley 2014-08-07 007 (7).© Paul Montagne.monde-de-lupa.fr. 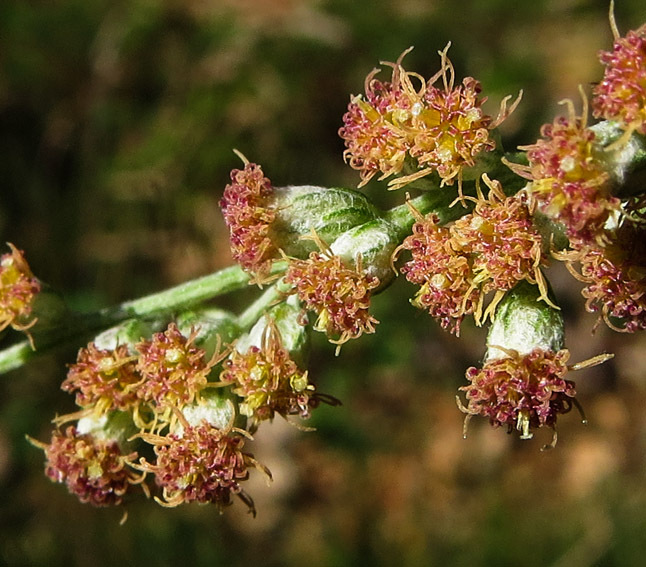 Fruit dry, 1-seeded, to 0.2 cm long, no plume or wing for dispersal; apparently rarely viable except under greenhouse conditions, very few seedlings produced in the wild (Uva et al. 1997), however 200-yr-old seeds have been germinated (Barney and DiTommaso 2003). Frequency in NYC: Very common (ubiquitous). Habitat: Open upland areas, fill, berms, landfills, dry, disturbed areas. Does well on concrete rubble. In NYC found on soil with pH 5.1-8.9 (USDA, NRCS 2006), most often pH 7-8 (Gargiullo and Kortebein unpublished data). Notes: Almost all reproduction is by rhizome fragments, very commonly contaminating the root balls of nursery plants and in fill soils (Uva et al. 1997). 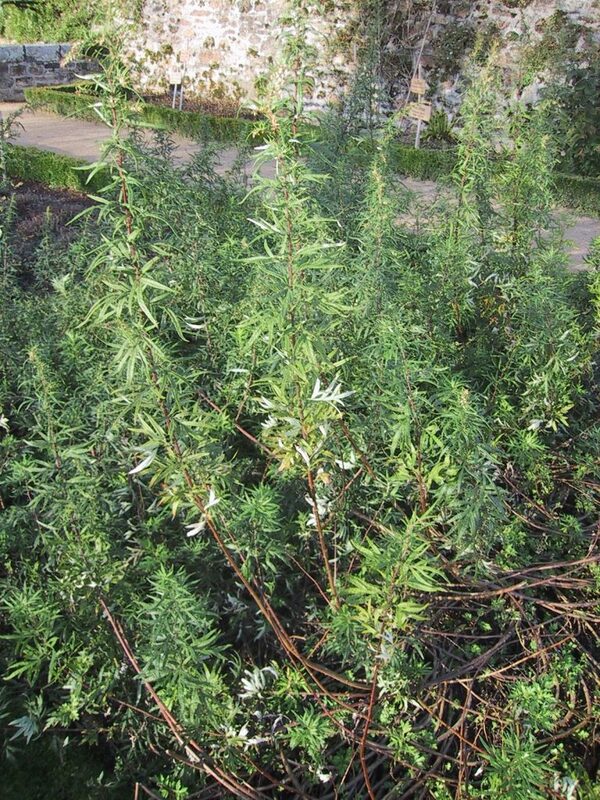 Very aggressive, covers large areas, forming monocultures and displacing most native herbs. Tolerates mowing, at least for some time and is immune to many herbicides (Uva et al. 1997). Intolerant of shade. Growth rate 15.46 (relative to 9.24 for B. populifolia and 0.99 for sugar maple). Growth rate was found to correlate well with relative shade tolerance (Grime 1965). Has been used medicinally for many ailments. Leaves contain a phytotoxin that was found to inhibit growth of several other plants. 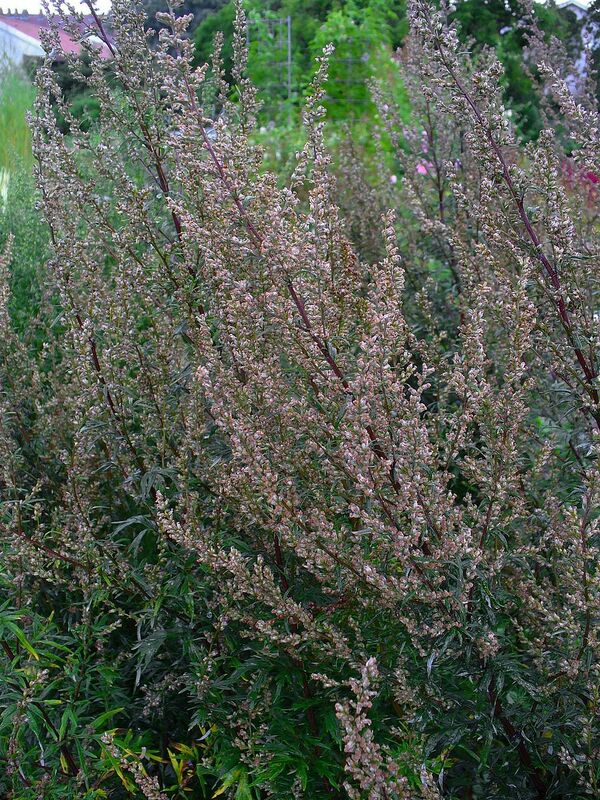 There is very little information on herbivory or diseases in mugwort (Barney and DiTommaso 2003; Inderjit and Foy 1999).